Wayne E. Welk was born on April 28, 1931 in Chicago Heights to Otto and Minnie (nee Siekmann) Welk. 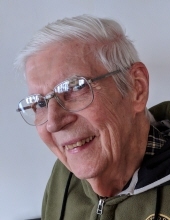 He died Sunday, October 14, 2018 at Church Creek in Arlington Heights. Mr. Welk worked as a manager of Corporate Planning for Patten Industries in Elmhurst. He was a member of St. Peter Lutheran Church in Arlington Heights. Wayne was a member of Phi Kappa Psi Fraternity through the University of Illinois. Wayne loved photography, music, sailing and also working with stained glass and clocks. He loved to spend time with his family, especially his grandchildren, and was loved by all. Wayne is survived by his sons, Alan (Ann) Welk and Dale (the late Amy) Welk, grandchildren, Marcia (Chip) King, Joseph Abeln, Misty Abeln, Alexandra (Jeff) Kenna, and Morgan (Johnathon) Manning; great-grandfather of five; brother, Robert (the late JoAnne) Welk; and many nieces and nephews. He was preceded in death by his wife of 57 years, Lois (nee Albrecht); his parents; son, Carl Welk; and brother William Welk. Visitation Thursday, October 18, 2018 from 3:00 pm until the 7:00 pm Funeral Service at Glueckert Funeral Home Ltd., 1520 North Arlington Heights Road (4 blocks south of Palatine Road), Arlington Heights, IL 60004. Interment will be private. In lieu of flowers memorials may be given to St. Peter Lutheran Church, 111 West Olives Street, Arlington Heights, IL 60004 or to your favorite charity in Wayne’s memory. Funeral Information and condolences can be given at www.GlueckertFuneralHome.com or (847) 253-0168. "Email Address" would like to share the life celebration of Wayne Eugene Welk. Click on the "link" to go to share a favorite memory or leave a condolence message for the family.